The first album, "Level 42", was released in '81. It captured the essence of the band in its purest form, a smooth blend of instrumental jazz and funk. Shortly after "The Early Tapes" were released, a collection of demos from '80, so this is really their 1st abum and "Level 42" their 2nd. These were the days before image consultants, sponsors and large stageshows. 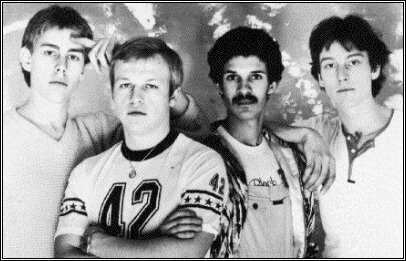 A level 42 show in 1981/82 meant muscleshirts, sweats and sneakers. It meant first and foremost MUSIC. Phil Gould was the drummer at that time, and provided a slick, speedy jazz-funk rythm. His brother, Rowland Gould, on guitar, took care of the rock edge in his solos and funky grooves with his subtle rythm work. Excellent showcases of this are "Starchild", the 2nd single from "Level 42", and "The Return of the Handsome Rugged Man", the b-side of "music/are You Hearing What I Hear? ", the single from their 3rd album "The Pursuit Of Accidents". On keyboards and vocals, Mike Lindup took care of lead and supporting parts. Often he would accompany his solos with his falsetto voice, which also teamed up perfectly with Mark King's. Mark King only ever wanted to be a drummer, but ended up singing and playing bass. The world was confronted with "Thunderthumbs", the man that made slap bass-playing the ambition of just about every person who ever had played the bass. Good examples of this are "Love Games", the 1st single from "Level 42", and "Leaving Me Now", the melodic ballad from their 7th album "World Machine". I heard "Love Games" on the radio in november of 1981 when I was 16 and still lived in Holland. A friend, who happened to be a girl, hooked me up with a tape of the album. Then the band played a show in De Meerpaal in Dronten, Holland, that was broadcast on the radio on December 10th, 1981 and luckily I have an excellent recording of this now legendary performance. It was not until April 30th, 1982, that I got to see Level 42 live in Vredenburg, Utrecht, Holland. This 23 year old bass-player, dressed completely in black with a black muscle-shirt, mesmerized me with his playing on the opener "Almost There", with his right hand moving so fast it was a blur. Well, life has never been the same. To put it all into perspective, I have listened, enjoyed, watched, followed and seen these guys HALF of my life. In the summer of '85 "Physical Presence" was released, a double live album capturing what Level 42 does best: play live. After "World Machine" came "Running In The Family", their most commercially successful album. This marked the end of the original four line-up. Boon and Phil Gould left the band and Gary Husband and Alan Murphy took their places. Unfortunately Al Murphy died after the band completed their 9th album, "Staring At The Sun", and the subsequent tour. In '96 "Live at Wembley" came out, a long overdue 2nd live album of the tour in '89. In '91, the band's 10th album "Guaranteed" had Allan Holdsworth on guitars in the studio. Jakko Jakszyk joined the band as the tour guitarist. The last album "Forever Now" marked the return of Phil Gould on the drums. The last time I had the privilege of seeing them perform live was on November 10th, 1991, the "Guaranteed" tour in De R.A.I., Amsterdam , Holland. Level 42 played their last show at the Royal Albert Hall, London, on October 14th, 1994. However, the story does not end here. Boon Gould, since leaving in '87, had still been working with Mark on songs & lyrics for "Staring At The Sun", and in '95 released his solo album "Tin Man". That same year, "United States Of Mind" was released, a Talbot/White album on which Phil Gould played keyboards and co-wrote two tracks. In '96, after Mark King did the Pier 1 interview, it seemed he was about to release a new solo album, but it was shelved. New lyrics written by Boon, inspired Mark to start from scratch and write new songs that would become "One Man", released in '98. Mark played as part of "Night Of The Proms" in late '98, and in Jan/Feb '99 he played 7 dates in the U.K. on the "One Man" Tour. Later in '99, Mark released "Trash", a collection of demos and unused songs, his '96 (shelved) album! The CD sold well over a 1000 copies on MARK-KING.COM website. Mark King formed "Grupo Mark King" (with Gary Husband & Jakko Jakszyk), and toured the U.K. again in November '99. The CD "Live at The Jazz Cafe" followed in the footsteps of "Trash". Mike Lindup stepped back into the public eye in May '99 when he appeared at The Komedia in Brighton with Gavin Harrison. There he revealed plans for a new album "Conversations With Silence". Mike has played with Post Pop Federation and, since 2000, he tours with Da Lata. In August of 2000, three quarters of the original Level 42 line-up reunited for a private show. Phil Gould invited some musician friends to play, including his brother Boon and Mike Lindup. They jammed old jazz rock favorites like "Haunted House" and also "Something About You" and "The Sun goes down". In 2000, Mark King played at the Ryde Theatre on the Isle Of Wight and released the "Live on the Isle of Wight 2000" CD-ROM and DVD. More gigs in 2001, this time with a setlist voted on by the fans. In late 2001 Mark secured the rights to the name Level 42 and subsequently released the "Level 42 Live at Reading" CD and DVD. In the fall of 2002, Level 42 started the Greatest Hits Tour, with opening act Steve Lawson. The new Level 42 line-up: Mark King (bass & vocals), Gary Husband (drums), Lyndon Connah (keys & vocals), Nathan King (guitar & vocals) and Sean Freeman (sax). A new compilation, the Ultimate Collection was released to coincide with the tour. In March 2003, the Level 42 Ultimate Tour 2003 dates for October and November 2003 were announced. In April 2003, Level 42 did several dates in Indonesia, and a few festival dates in Europe through the summer. In May of 2003 there were brief rumours that the orginal 4 members were working on a new album, but unfortunately this was not be. The "Live At Reading" CD and DVD was re-released as "Greatest Hits Live" followed by a remastered "Level Best" called "Level 42 - The Collection". In October, Mike Lindup's long awaited solo album "Conversations With Silence" was released. The last UK date of the Ultimate Tour was November 22nd, 2003 at The Apollo, and this was filmed resulting in the "Live at The Apollo" DVD. In February and March 2004, the Mike Lindup quartet (With Tristan Banks, Andy Lafone and Miles Bould) did several shows in the UK. In April, Jakko Jakszyk goes on tour with the 21st Century Schizoid Band, and Level 42 tour dates are announced for late 2004 (including 2 dates in Dubai). On February 13th, 2005, Level 42 played a historic date at The Forum in London. For the first time since October 14th, 1994 at The Royal Albert Hall, Mike Lindup joined Level 42 on stage! In March, the two Rockpalast shows from '83 and '84 are released on DVD, and in April, a show from '83, recorded in Scotland ,surfaces on CD called "The River Sessions". In June, The Ultimate Collection II is released including a brand new track called "Genius Of Love" by Hardage featuring Mark King on vocals and a sample of "I Want Eyes". In January 2006, Mark King does an interview with the Isle of Wight County Press, and the article mentions a new album, co-written with Boon Gould, which should be finished in a couple of months. In February, Jakko Jakszyk announces his new double-cd The Bruised Romantic Glee Club featuring collaborations with Lyndon Connah, Mark King, Gavin Harrison, Gary Barnacle & Nathan King. In April, a 2nd Hardage track surfaces called "The Sweetest Pain" with Mark King on vocals and bass. In May, another compilation "Level 42 - The Definitive Collection" is released. 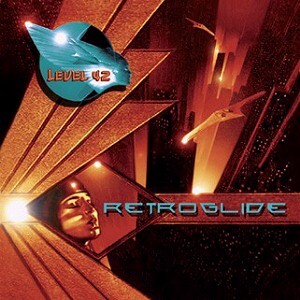 And then finally in June, the new Level 42 album is announced: "Retroglide" to be released September 18th, 2006. The artwork is by Alan Brooks, who also did the covers for "The Chinese Way" and "Out Of Sight Out Of Mind" singles.